Bio: Coach Laney was born in Knoxville Tennessee but has lived most of his life right here in Chattanooga. He is an LFO graduate from the Class of 2008 and afterwards went locally to Dalton State College. He Graduated in 2012 and started his teaching/coaching career in Hamilton County Tennessee. He taught and coach for two years before returning home to his alma mater in 2014. 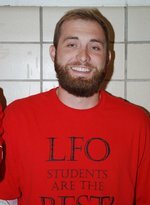 He has been teaching and coaching at LFO since. Coach Laney married one of his fellow classmates from 2008 Trinity Shipley and they are expecting their first child this year.